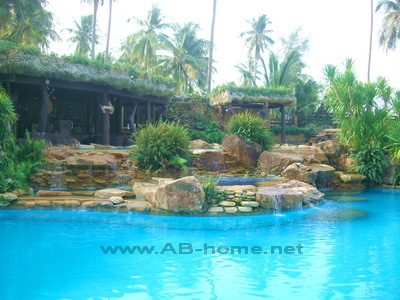 Luxury beach holidays on a paradise beach on Ko Chang. The 5 star hotel Panviman is located in Klong Prao Beach on Koh Chang. Panviman Koh Chang Resort is one of the leading accommodations for luxury holidays on Thailand’s second biggest Island. The nice swimming pool with Jacuzzi and pool bar is the heart of this boutique resort. Klong Prao Beach is one of the most beautiful beaches on Ko Chang and a good site for walking and jogging in Thailand. The rooms at Panviman Koh Chang are huge and appointed with deluxe furnitures, mini bar, bathtub, TV and balcony. Next to the reception are a small shop with internet access and souvenirs. Panviman Resort Koh Chang attracts many honeymooner and tourists who looking for a luxury hotel and boutique accommodation in Thailand. The great location on the beach, the tropical garden and the suites make Panviman Resort to a unique location for beach holidays in Klong Prao. Koh Chang Hotel Bookings and Reservations.